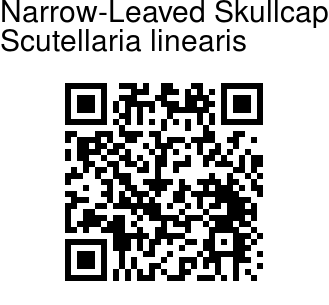 Narrow-Leaved Skullcap is a perennial, tufted, woody herb with a thick woody rootstock. Stems are 7-30 cm, ascending or rising, round-quadrangular, with short, crisped, eglandular hairs below, longer patent glandular and eglandular hairs above. Leaves are linear, thick-textured, 0.6-2.8 cm x 1-5 mm, entire, with curled margins, cuneate, pointed, with clusters of younger leaves in leaf axils. Upper surface has short, adpressed, eglandular hairs, underside has denser hairs with numerous glands. Leaf-stalks are 1-3 mm. Flower-spikes are 4-sided but appearing 1-sided when pressed, lax, terminal or lateral. Flowers occur in the axils of ovate to elliptic, 3-7 x 2-3 mm, bracts which are entire, cuneate, pointed or blunt, thin-textured, glandular, hairy and hooded. Flower-stalks are 1-4 mm, erect, flattened. Sepal cup is 1.5-2 mm, with a small, sometimes purple, scutellum in flower, enlarging in fruit to 3-4.5 mm with 2.5-3 mm high scutellum. Flowers are 1.4-2.2 cm, pinkish mauve often with yellow markings, erect or erect-spreading, glandular-hairy. Flower-tube is 0.8-1.6 cm. Nutlets are about 1.5 x 1 mm, blackish, densely covered with adpressed white hairs. 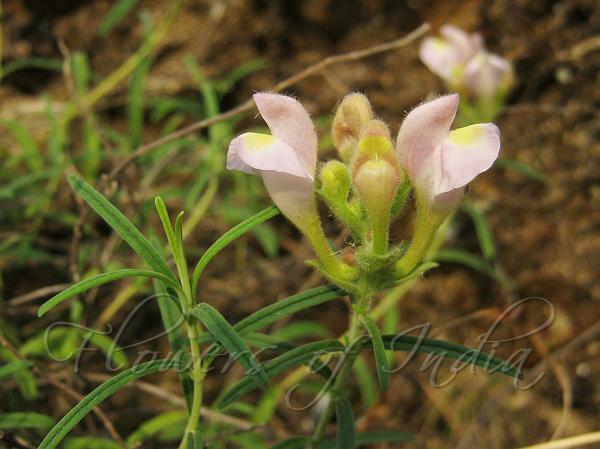 Narrow-Leaved Skullcap is found in the Himalayas, from E. Afghanistan, Pakistan, Kashmir, NW Himalayas. Flowering: May-July.